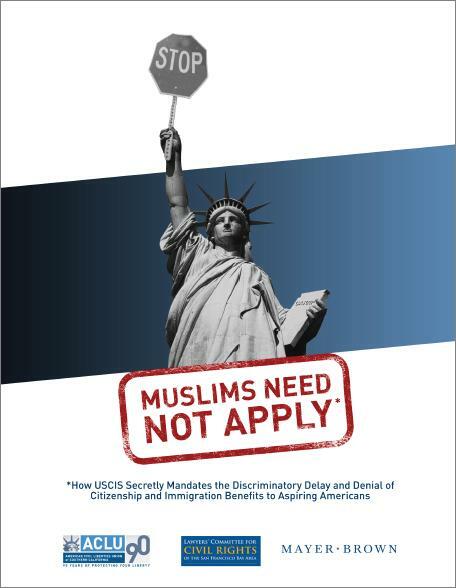 A government program to screen immigrants for national security concerns has blacklisted some Muslims and put their U.S. citizenship applications on hold for years, civil liberties advocates said Wednesday. The criteria used by U.S. Citizenship and Immigration Services to blacklist immigrants are overly broad and include traveling through regions where there is terrorist activity, the report said. “It is essentially creating this secret criteria for obtaining naturalization and immigration benefits that has never been disclosed to the public and Congress hasn’t approved,” said Jennie Pasquarella, an ACLU staff attorney and the author of the report. “I feel like ultimately this is just about politics. They don’t want to be seen as having granted citizenship to somebody who’s going to be the next Boston bomber,” she said. Christopher Bentley, a spokesman for Citizenship and Immigration Services, said the agency routinely checks the background of immigrants applying for benefits and prioritizes the country’s safety and the integrity of the immigration system. Under the program, immigration officers determine whether a case poses a national security concern and confer with the appropriate law enforcement agency that has information about the immigrant. Officers then conduct additional research and put many cases on hold for long periods of time. Most applications are eventually denied, as the program states that officers are not allowed to approve such cases without additional review, the report said. Iranian math professor Mahdi Asgari started receiving visits from FBI agents after he applied to naturalize three years ago, the report said. At one point, agents asked him about his relationship with a fellow Iranian graduate student whom he now has little contact with. Asgari was recently granted citizenship, the ACLU said. This entry was posted in Resisting Islamophobia, State Oppression, USA by Bob Pitt. Bookmark the permalink.